I have recently been focusing my attention on graduate programmes. In particular I’ve been interested in identifying patterns that are common across schemes. In order to build my picture I conducted some fairly straightforward research amongst the UK’s largest companies, specifically the FTSE 100 and FTSE 250. The first thing to note is that while a high proportion of the bigger companies offer graduate programmes, they are less favoured amongst the cohort of smaller companies. Something else of note is that almost every programme states a minimum entry standard of an upper second class degree or equivalent, usually this means a GPA score of between 300 and 350. They also typically expect a UCAS score of at least 300, sometimes more for specialist areas as opposed to general management. The application period is usually in the autumn, and if a candidate gets through those two or three stages they will typically be invited to attend an assessment centre in the early part of the following year. Almost all schemes appear to include an assessment centre stage. Group exercises, the purpose of which is to see how an individual contributes in a team environment. They often involve role play or group discussions. Presentations, where some information, data or case study will have been provided either on the day or in advance, and the objective is to see how the candidate analyses information, synthesises ideas, and/or communicates to a group. Psychometric inventories. Companies use a variety of tests to assess personality, ability and intelligence. These tests are also sometimes administered online before the assessment day. Occasionally, and more controversially, some tests have been developed to measure integrity and propensity to display anger. Correctly handled, the employer will use the test results to explore relevant matters in the interview. Work based exercises are sometimes used to see how well a candidate executes the type of task they might be required to perform in the job. They are often some type of problem solving (sometimes also done in a group setting) or as an in-tray exercise. Interviews are almost always a part of the process, sometimes linked to the other exercises, i.e. interview questions follow up on observations made during the activities. Other types of interviews are technical and competency based, and may be either be HR staff or line managers / departmental colleagues, and set up as one to one or panel. These are the most common elements but it’s important to recognise that each company is looking for a particular combination of qualities and will possibly have specific tools to explore those factors. This article only scratches the surface of the assessment centre. There is much to say about each of the above elements, not to mention the various stages that take place even before the assessment centre. I’m so pleased that we are entering the holiday season. All work and no play makes Jack a dull boy. In the case of Jack Nicholson’s character in Stanley Kubrick’s The Shining, it made him much worse than dull. During my working life I’ve seen the number of hours worked by white-collar employees gradually increase. I’m not talking about the standard working week. I’m talking about the additional hours referred to in employment contracts as “and any other times you are required” or something similar. These are the hours that you work late into the night, or early into the next morning, whenever a deadline approaches, because the alternative would be that next time there’s redundancies are in the offing your name might be on the list. Don’t misunderstand me. This is a fact of modern life. I think it’s wrong but I can’t offer an alternative for a service based economy where people are the machines and being competitive requires squeezing as much out of those machines as possible. My issue is that employers on the whole, don’t appear to recognise how this relentless life is bad for business. Workplace stress, anxiety and depression is at unprecedented levels accounting for 10 million sick days per year, that’s 43% of all days lost for reasons of ill-health. It has taken over from back pain as the top reason for absenteeism, reflecting our transition from a physical to a mental economy. So while employers may not be moved to address the issue (and it should be stressed that the problem is far, far greater in the public than the private sector) at least this season gives employees the opportunity to turn off the technology and leave work alone until January. That’s right. Just put it down. It can wait whereas your health can’t. You need to be attending to your well-being all the time. I’m not so naive to imagine that bosses and clients won’t try to make contact over the holiday period, and you may not want to ignore those calls, so at least try to contain dealing with those approaches to certain ring-fenced times, and relax as much as you can the rest of the time. Put messages on your voicemail and set up an “out of office” response on your email. Otherwise, coming back in January without having felt you’ve been able to re-charge the batteries will set the new year off on a bad footing. Of course, you may be one of those people who finds being stuck with the family more stressful than work, in which case I suggest you volunteer to go in between Christmas and New New Year for your period of relaxation, after all, as we all know, nothing happens in the office then. How much work do you do for nothing? If the amount of time and work that goes into trying to win business makes the endeavour so uneconomical for small suppliers that they stop pitching, the outcome is that they miss out on business, and the client may miss out on the best supplier. When I first saw this I thought it good that the advertising industry is fighting back on behalf of creatives and consultants. Then I showed it to a friend who works for a consulting business and he thought otherwise. Of course the film is ridiculous in many ways but the idea of whether a supplier should be expected to put time and intellectual know-how into a proposal that will likely not result in a fee is worth considering. Now it’s possible that this self-selection is a good thing, after all, a big project will need significant resources. It would be a disaster if half way through an important change programme the consulting business was forced to admit that they were not well enough resourced to continue with the project. But is it fair for a freelancer with limited time and resources be expected to make an up-front gamble like this in the hope of winning even a modest amount of work? Let’s accept that the resources expected to be put into a pitch reflect the size of the project. Should we be worried about the losses incurred by those who are unsuccessful? The question is, are clients expecting more than necessary from suppliers at the pitch stage? This is where my friend and I differ. His view is that this is simply a cost of sales – marketing. Any agency or individual consultant will expect to win some and lose some. If they lose too many then they are doing something wrong and need to improve. Furthermore, they absorb the cost of pitches in the work they successfully win. The model I have always used is that a third of my time goes on marketing, a third on working and about three quarters on cycling (maybe that’s where I’m going wrong). My concern is that clients expect too much and encourage potential suppliers to compete at too high a cost to themselves for work, thus making it a much riskier proposition for small agencies and individual freelancers. What do you think? Are clients expecting too much and raising the barrier too high for small businesses at the pitch stage? It never fails to amaze me how how many bosses are such poor leaders. The reason, I believe, is that those who are doing the promoting tend to value qualities such as determination, confidence and presentation skills amongst the best indicators of leadership potential, often resulting in the promotion of those most ambitious to climb the ladder. Furthermore, while they may not realise it, decision makers are highly influenced by the candidate’s ability to “play the game” also known as “managing upwards”. These people are good talkers able to tell a great story about success, and place themselves in the starring role. In other words, leaders are often made into leaders not because they have the right skills for leadership, but because they impress, and it’s easy to confuse an impressive personality for leadership potential. There comes a point, however, when true leadership qualities are required because if they are not present then the right things don’t happen, people leave and organisations begin to fail. For me there are three types of asset in a business: financial, capital and human. Humans control the financial and capital assets, so I would argue that the best bosses are the ones that are good at managing people rather than those that are good at managing the financial or capital assets. Interestingly, many organisations promote on the basis of technical achievements – a finance person may be promoted because they are good at making investment decisions, an operations specialist is promoted because they make sound decisions about organising the equipment or properties owned by the business. Organisations often fail to realise that once promoted these people do less of what they are good at, and instead are expected to direct others who manage these other resources, yet the employer rarely consider whether the person also has the required people management skills. Managing people is very much about listening because listening effectively builds trust. If I feel heard then I am more likely to put my faith in your judgement. In other words, trust means a person will follow their leader. If you want to be a successful leader, any leader, you need followers. To get followers you need people to trust you and believe in your vision. To get people to trust you, you need to show you understand them and you can only do that by listening carefully and empathically to them. When looking for leaders I would argue for seeking out the good listeners before the good talkers. I’ve always considered myself to be something of a loner when it comes to work. For as long as I’ve remembered I’ve wanted to work for myself and I realised several years ago that while I enjoy collaborating with others I never really warmed to the idea of working more closely with others than on an associated basis. I’ve also noticed how quickly I settled into this narrative of myself as a sole-trader and how it allowed me to limit my personal ambitions. Working closely with another person brings expectations and responsibilities that I’d sooner decline. However, as well as being safe and comfortable, working alone is limiting in terms of what I can do. Not only am I excluded from certain projects because of lack of scale or the full range of skills required, I am also unable to grow into interesting new areas of work and activities that comes of collaborating with people with a different perspective and set of experiences. When one person walks a journey alone the possibilities are limited, but when that person’s path intersects with another person’s, the possibilities for the continued journey, bringing together their combined experiences, are surprising and many. It is for this reason that with a mixture of excitement and slight anxiety I have started to work closely with my friend Aboodi Shabi. Aboodi and I have known each other for several years, and we enjoy each others company very much. I vividly remember the first occasion we spent together. It was several summers ago and we went for a long walk along the beach near Chichester. We talked at length about all sorts of things. I remember it as a very peaceful conversation, a very thoughtful conversation. We gelled easily, sharing our time and the space equally, learning from each other, and making each other laugh. We’ve had many similar conversations since, although that one is, inevitable, the most memorable. We’re not sure exactly where our collaboration will take us. It’s starting off with some work and teaching around two topics of shared interest: entitlement, and the way people have conversations with each other. Aboodi is going to be sharing my website at www.thoughtfulconversations.co.uk and we’ll use it as the launchpad for some of our joint and individual teaching and coaching projects. We’ll also be writing for a co-produced newsletter also to go under the name of Thoughtful Conversations. We hope you find our contributions there stimulating. So, 2011 should be exciting and interesting for me. I’m excited about these fascinating new topics Aboodi and I will be exploring together, and I’m interested to see how successfully I am able to work closely with another person. I was talking with my wife about a close friend of ours the other day. I am very fond of this person. He is kind, generous and highly principled. In fact he has a number of lovely qualities. However, many people, even those who know him as well as I, can’t stand him. If you were to ask them about him they would say he was opinionated, loud, he dominates the conversation and he’s always talking about his achievements. And guess what? They’d be right. He’s all of those things. I can see it as well. Is my friend self-aware? I think he is to some extent – I have gently teased him about how much he talks and he smiles as if to say “I know – I can’t help it”. He’s not taken his self-awareness to the stage of initiating change. Maybe he doesn’t know how to, or have the motivation to change. I believe that we are just as addicted to our behaviours, even those we wish to change, as we are to say, smoking or over-eating. Self-awareness is one of those things people talk about quite a lot, but it’s rarely looked at in much detail. In the job market, we talk about candidates as being self-aware but I’m not sure recruiters and employers really know what they mean by it. It’s just a buzzword. First, we need to be specific when we describe someone as lacking in self-awareness. My friend only lacks self-awareness in terms of the way he behaves and affects people in conversations. He’s perfectly aware of his values and beliefs. He is also pretty accurate as to his professional strengths and weaknesses. That’s not to say that his poor self-awareness in the area of social skills is small; over the years it has caused him significant difficulties in his career because he has got up the wrong people’s noses. So how can we examine self-awareness in a little more detail? 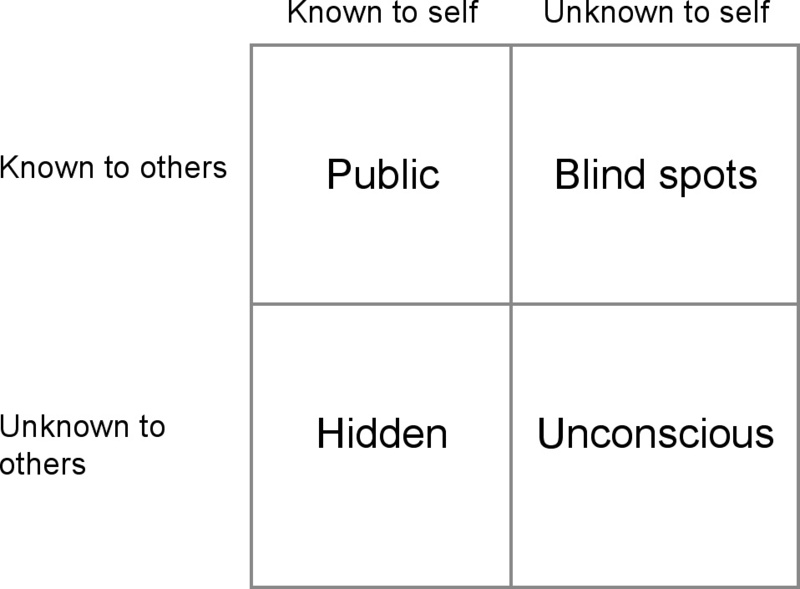 The well known Johari window is a good starting point. (By the way did you know that the Johari window is so named because it was devised by two guys, one called Joseph and the other Harry? I bet you’re pleased you’re reading this now). An open and self-aware person will have a relatively big “Public” box. Private and self-aware people will have a relatively large “hidden” box. These are both to do with what is in our self-awareness and the important thing is to increase that left hand side of the grid relative to the right. Reducing the size of the boxes on the right comes from talking to others. When it comes to uncovering the unconscious, your companion needs to be skilled at listening. This is the work of counselling because you are entering into unknown territory together. The questions that need to be asked must be carefully considered and asked tentatively – they are an invitation to think about something that might appear to be very slight and more importantly, possibly painful. Similarly, honest conversations with a few people who know you well can help you to uncover your blind spots, but you need to ask them. People will not want to offer this kind of feedback to you uninvited because it can be painful and it really is your responsibility to seek it. Many people say that a good friend is one who will tell you the stuff that you may find painful. That’s true, but a good friend would be very careful in the way they approached the subject, and most would wait for the invitation. The next stage is to accept who you are. You may find it difficult to believe the feedback you are being given, but if a few trusted people all say more or less the same thing, you’ve got to take it seriously. It may be painful but it’s worth living with that feedback for a few days to get used to it. Once you have accepted the feedback you will begin to notice it as you go about life and it will be confirmed in the way others behave towards you. You will begin to see how people react to your behaviour and associate it with that part of you that you wish to change. Change is not instant and it may seem impossible at first. All you will notice is your failure rather than your successful change. Each time this happens, ask yourself how you might have done something in another way. Ask yourself what it might have been about that situation that caused you to adopt that old behaviour. Then next time you find yourself in a similar situation consider what you might need to do in order to be different. In time you will be making a habit of the new behaviour or way of being. But remember, it’s a slow process, and even when you are doing well, you will slip back into the old way. It’s inevitable because what you are asking yourself to do is to undo a lifetime of behaving in a particular way. In fact, I’d say that most people never fully rid themselves of that old behaviour, because to some degree it’s hard wired. What you can do, however, is make it the exception rather than the rule.